Experience the flavour of Kamado style cooking. The Vision Grills Kamado Pro replicates wood oven cooking and provides flexibility to sear, grill and smoke meats and vegetables as well as bake pizzas and bread. The Vision Grills Pro zone will take your grilling experience to a new level with an electric starter port for lighting ease, dual calibrated draft vents for superior temperature control and a removable ash drawer for easy clean out. The grill is constructed of high grade ceramic and delivers 604 sq. inch with 2-tiered stainless steel flip grates. Includes 2-solid surface drop down shelves, aluminum alloy calibrated top vent and cart with locking rollers for mobility and a full length heavy duty vinyl cover. Limited Lifetime Warranty for all ceramic parts. Five Years for all metal parts, One year for temperature gauge, gasket and cover. 90 Days for wood components. This Compact Charcoal BBQ from Dyna-Glo offers quality, performance and versatility. With 545 sq. inch of cook space, you can serve that smoky flavour to your family and friends for years to come. 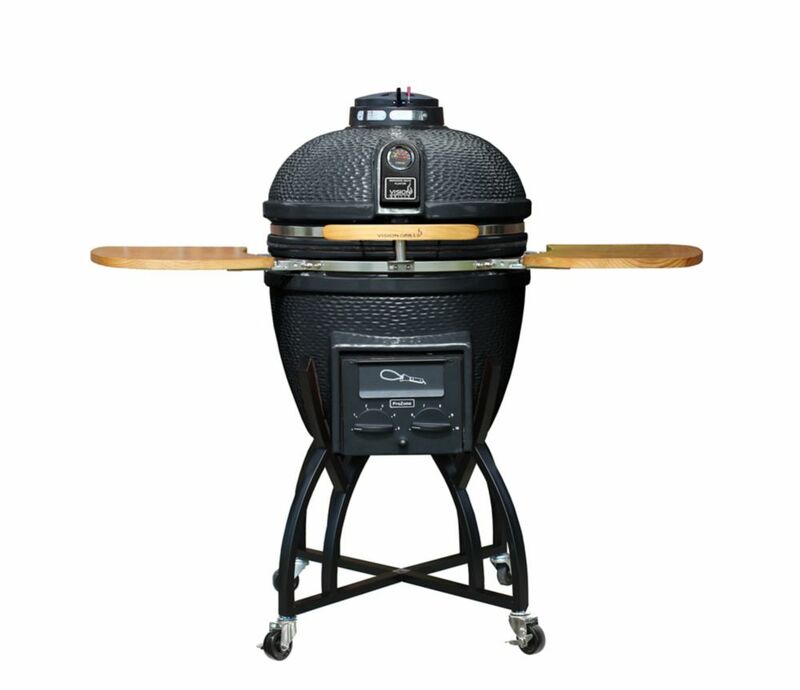 Designed for efficiency and control, this grill features an adjustable crank to raise and lower the charcoal tray. Porcelain enamelled cast-iron cooking grates maximize heat transfer and make for perfect searing. You can easily customize the cooking temperature by using the adjustment crank to raise and lower the charcoal tray. To reload and stoke the charcoal, simply open the steel access door on the front of the grill. Achieve further heat control by adjusting the stainless smoke stack flue. The grill also features a double-walled lid and front firebox that help minimize heat loss and improve the burn efficiency of your charcoal. The side table serves as an aid in preparing and holding your food and tools as you cook. The side table folds for compact storage. This Heavy-Duty Charcoal BBQ in Black from Dyna-Glo offers quality, performance and versatility. With 686 sq. inch of total cooking space, you can serve that smoky flavour to your family and friends for years to come. Porcelain enamelled cast iron cooking grates maximize heat transfer and make for perfect searing. You can easily customize the cooking temperature by using the adjustment crank to raise and lower the charcoal tray. To reload and stoke the charcoal, simply open the steel access door on the front of the grill. Achieve further heat control by adjusting the stainless smoke stack flue or the dampers located on each side of the firebox. The grill also features a double-walled lid and front firebox that help minimize heat loss and improve the burn efficiency of your charcoal. The two side tables serve as aides in preparing and holding your food and tools as you cook with ease. Clean-up is simple with a removable ash pan and wheels for storage. This Heavy-Duty Premium Charcoal BBQ in Black from Dyna-Glo offers everything you need to enhance your outdoor cooking experience. With a total cooking space of 816 sq. inch and easily accessible and adjustable charcoal tray, you can achieve that classic smoky taste with ease every time you barbecue. The stainless smoke stack features an adjustable flue for fine tuning temperature control, and the heavy-duty porcelain enamelled cast iron cooking grates retain heat to sear foods and lock in their natural juices. This grill features a temperature gauge so that you can easily monitor your heat level and maximize your cook performance. The 3-Piece sliding cooking grates offer easy access to charcoal during the cooking process, and the heavy-duty cast iron charcoal access door helps to retain heat for optimal fuel efficiency. With a bottle opener on the front of the grill, you can keep the party going as long as you want with your Dyna-Glo Premium Charcoal Grill. Kamado Pro Ceramic Charcoal BBQ with BBQ Cover Experience the flavour of Kamado style cooking. The Vision Grills Kamado Pro replicates wood oven cooking and provides flexibility to sear, grill and smoke meats and vegetables as well as bake pizzas and bread. The Vision Grills Pro zone will take your grilling experience to a new level with an electric starter port for lighting ease, dual calibrated draft vents for superior temperature control and a removable ash drawer for easy clean out. The grill is constructed of high grade ceramic and delivers 604 sq. inch with 2-tiered stainless steel flip grates. Includes 2-solid surface drop down shelves, aluminum alloy calibrated top vent and cart with locking rollers for mobility and a full length heavy duty vinyl cover. Kamado Pro Ceramic Charcoal BBQ with BBQ Cover is rated 4.6 out of 5 by 583. Rated 5 out of 5 by Treamaya from Everything was packaged very well and delivery was excellent. They delivered to my back patio wh... Everything was packaged very well and delivery was excellent. They delivered to my back patio when I wasn't there, so my wife didn't have to try and move it. Once you remove everything from within the grill, 2 people can easily pick it up and place it on the stand ( after you assemble it). Works fantastic! I grilled fish yesterday that was perfectly cooked, no flare ups or burned skins. VERY happy with this decision to buy this grill. Rated 5 out of 5 by Herb from The grill is super. High in quality and does just... The grill is super. High in quality and does just what they say it will. Rated 5 out of 5 by OldSalt from We also bought the gas grill conversIon kit. The... We also bought the gas grill conversIon kit. The radiation stone and ceramic bowl retains heat and helps create very even cooking. A very unique cooking application and great results. Rated 5 out of 5 by BB from Grill has met all my expectations. The grill arrived in perfect condition with no blemishes or im... Grill has met all my expectations. The grill arrived in perfect condition with no blemishes or imperfections. I purchased assembly which was done well and the grill was placed where I wanted it on my patio. I have had the grill a week and have seared, grilled and smoked meats on it. Based on other reviews I was concerned about achieving and maintaining smoking temperatures. I had no problems maintaining temperatures of 200F to 250F during an 11 hour smoke. I did not experience any smoke leakage around the ash removal/vent/lighting assembly. I was very pleased that I did not need to add more charcoal during the smoking process. The reason I rated quality good rather than excellent was due to the thermometer not reading correctly (I must say, I have never owned a grill where the thermometer did read correctly). I am thrilled with the quality and performance of the grill and highly recommend it. Rated 5 out of 5 by JohnB from We had a medium big green egg for 10 years.... We had a medium big green egg for 10 years. Decided to upgrade to a bigger unit. Large egg was $1200+ & the extra large was $2000+. Decided to look at competitors. We decided on the extra large Kamado because of price difference. Love it. Can't tell the difference between the two. Recommend. what accessories does this model come with? It came with the inside grills and the protective cover. No other accessories were included, other that what is listed on the box. I highly recommend purchasing a deflector for a more even cooking when you don't want the food exposed to the open flame. When i was in the store i didn't notice a latch mechanism. Do your units have them? Were they not on the display models? Feel free to give us a call 877-917-4273 (dial &ldquo;2&rdquo; for Customer Service) and elaborate a little more on the latch mechanism you are referring to, so we can be of better assistance to you. What is the heat range of this grill? The grill can reach searing temperatures, of 700 degrees!